Over the years I’ve observed many personal trainers and coaches in different countries with various experiences and qualifications. No doubt about it – I’ve had the opportunity to observe many examples of bad personal trainers. I must also stress, I have fortunately worked alongside fantastic, inspirational and hard working fitness professionals of whom I have learned and benefited from as a result. I think you will agree with me that all clients are different – different strengths, weaknesses, goals, fitness levels and areas that require more focus than others. One size does not fit all and every client has specific needs. Trainers who prescribe cookie cutter routines show a lack of planning in terms of exercise prescription. 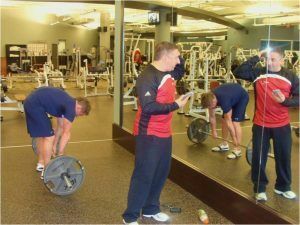 It’s generally wise to observe trainers at the gym to see if they are prescribing the same routine for multiple clients or uniquely working with each of their clients. Bret Contreras shows how to be the worse P.T. Some trainers insist their clients must do certain exercises even though the client is not comfortable with these, which can lead to pain and discomfort. This could have many consequences especially if the coach is unable to prescribe modifications and alternative exercises. PT’s that fail to correct improper form and technique could contribute to injury within their clients – not to mention frustration, discouragement and many more physical and mental issues. I’ve seen so many trainers putting their clients through the same program month after month. PT’s should change it up, adding modification, variety and progression. Our bodies need advancement and new challenges to test our abilities. Clients can become bored and stagnant with repetitive programs, plateauing progress. A coach who doesn’t change the program when clients adapt to the present training regime suggests inadequacy in thought & planning. As a rule of thumb, every client should be assessed initially. The assessment should include a body composition analysis, fitness testing, injury history, likes/dislikes and goal setting. Without this clients and coaches will not know where they are initially or where to go. This may limit the chances of seeing progress. Fitness professionals show clients results which rewards both parties for their hard work. Proof of results motivates clients to continue their training regimen beyond follow up assessments. I’ve witnessed “fitness professionals” make inappropriate contact with their clients. There’s no reason to touch clients unless performing something like partner assisted stretching. I’ve seen trainers taking advantage of this situation, potentially just looking for an excuse to touch their clients inappropriately. Fitness professionals need to be respectful and professional. There are personal trainers who really like being the centre of attention and who may sometimes scream at clients unprofessionally. There are far more effective techniques to motivate clients other than screaming and shouting. Moreover, the average client won’t feel comfortable being ranted at frequently during training sessions. A trainer who sits down with poor posture while their clients perform an exercise. It’s likely quite demotivating for a client to have a trainer sitting around with poor body language in the form of a slouched posture. This behaviour should also serve as a warning to potential observing clients, and an example to newer trainers on what not to follow. Too often I have seen trainers prospecting other potential clients while their clients are paying for their time, attention and expertise. PT’s should give their clients everything they have during their time together. Avoiding chit chat with other members, not texting on the phone and not becoming distracted by any other outside influence is a must do for PT’s while their clients train. There are people representing every industry who think they have done, seen and know it all. These may be people best to avoid. There is such a virtue in learning – we should never stop learning and educating ourselves. Elements are always changing with new research, especially in the health and fitness industry. All trainers and coaches need to keep learning to benefit our clients as well as ourselves. I’ve heard trainers who tell their clients all their problems – relationships, money, family, etc. Clients are there to be inspired and the trainer needs to be a role model and motivator. Trainers who complain about all of their problems can demotivate their clients, in turn potentially pushing them in the opposite direction – that being to subsequently find another fitness instructor. I regularly witness trainers that like long conversations with clients about all sorts of things, resulting in exercises not being done and intensity being de-railed. In some situations this is really the trainer showing off new found terminology on paying clients. Some of the terms used to impress clients often bemuse them, with clients just nodding in agreement without fully understanding or embracing what is being said. There is no impact in this technique – impact is what shapes the client’s progress and motivation. Clients expect superior workouts and results, not just standing around idol listening to words that go in one ear out the other. Your trainer should display a vested interest in you, your goals and your results. Any PT who does not show genuine support and encouragement should indicate a red flag. Chances are they have their attention elsewhere and not your best investment. Lastly, PT’s and coaches should be inquiring for regular feedback to optimize his/her clients progress. If you are currently training alone or considering investing in personal training, try using some of these tips I’ve given on great ways to burn fat and calories efficiently and effectively in the meantime. Hiring a good personal trainer should always be the fastest route to your short and long term goals. Another reputable resource id advise on researching a potential investment in personal training would be the Register of exercise proffessionls (REPS) Also U.K. based.